Iran IRGC's First 'Martyr' Versus ISIL? 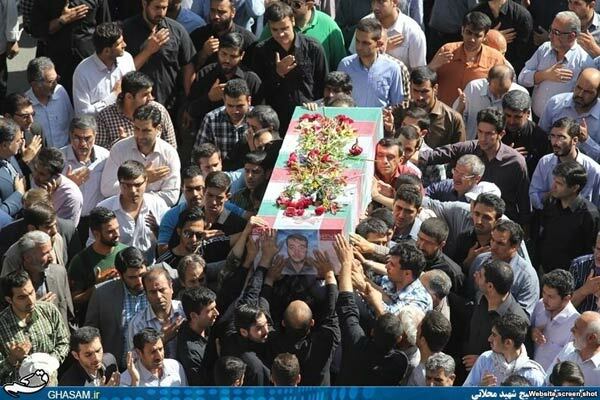 One of the photos that the Ghasam.ir website was publishing, purportedly of the coffin of IRGC member Alireza Moshajari from his funeral in Tehran on June 16. Several hard-line Iranian websites and blogs are reporting that Iran's powerful Islamic Revolutionary Guards Corps (IRGC) has lost one of its members as the result of the fighting in Iraq. The reports claim IRGC member Alireza Moshajari thus became the first Iranian "martyr" in the fight against the militants of the Islamic State of Iraq and the Levant (ISIL). Other conservative sites, however, have reported that Moshajari was killed in an accident in Iran while on duty. It wasn't clear from the reports whether he had been on a mission inside of Iran or returning from a mission from abroad. According to the reports, Moshajari was killed on June 14. His funeral was held in Tehran on June 16. There has been no official Iranian reaction to the reports, which also suggested that Moshajari was among Iranians who had previously traveled to Syria to defend the Sayida Zeinab shrine on the outskirts of Damascus (here and here). The hard-line Tasnim news agency, affiliated with the IRGC, posted pictures of Moshajari's funeral while saying that he was killed in "an accident" in Iran's Western provinces while on "a mission." The report appears to have been removed. A picture of Moshajari wearing his IRGC uniform has been widely shared on Google+, a preferred social media network of hard-liners, who have "congratulated" him over his "martyrdom" in Iraq. A picture of Moshajari's bloodied face was also making the rounds. One user, who said he was a friend of Moshajari, wrote that he was killed after he returned from a mission in Iraq. "My good friend martyr Alireza Moshajari is the first martyr of the defense of the Askari shrine" -- a Shi'ite shrine in the Iraqi city of Samarra -- "he had also traveled a number of times to Syria to defend the shrine of Zeinab and Roghayeh," Abbas Kolahduz wrote on Google+. He added that through his "martyrdom," Moshajari had joined "his master Imam Hussein," the first imam of Shi'ites. Another social-media user who identified herself as Moshajari's neighbor described him as "the first martyr of the support for Iraqi Shi'ites against Takfiris," according to a report by Shahidnews.com. The website said the user, Hanieh Pourahmad, had written about Moshajari on the Iranian social network Cloob.com. Pictures of Moshajari's funeral, posted by an IRGC website, show dozens of people carrying a casket shrouded in the Iranian flag. Ghasam.ir did not explain Moshajari's death. Nasimonline.ir, which also covered Moshajari's funeral, was silent about the circumstances of his "martyrdom." Western media have reported that the IRGC has dispatched several of its units to help the government of Iraqi Prime Minister Nuri al-Maliki battle the ISIL's militants and halt their rapid advances. Iranian officials have denied the reports while expressing readiness to help Iraq in its fight against ISIL.